Spent about SGD $35 per person. They may call themselves blur, but the founders behind Two Blur Guys certainly aren't blur when it comes to their fantastic gourmet burgers. 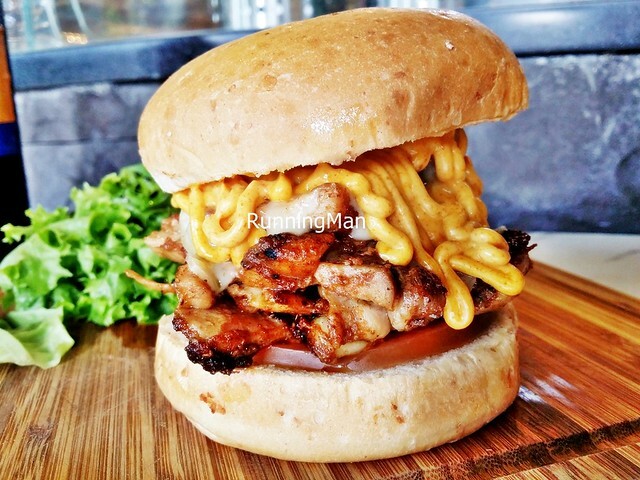 Founded in 2012 by Max Tung and Anthony Koh, Two Blur Guys serves mouthwatering, classic burgers with a specially designed wholemeal bun, all created by chef Jimmy Chok. 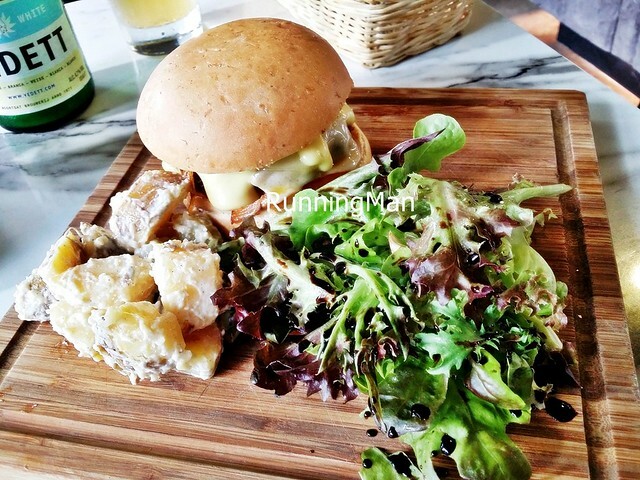 Ambience at Two Blur Guys is inspired by New York / American style casual diners. The small, cramped floor space of the original Tanjong Pagar outlet is in stark contrast to the large floor space of the Boat Quay outlet. Decked in black tones with low interior lighting, Two Blur Guys makes good use of natural lighting to brighten the place. I didn't like the fact that it's so open though, as the ambient temperature affects the experience greatly. Service at Two Blur Guys is fantastic. Staff greet you upon entry, are friendly and polite, and actually remember you when you return! In particular, there is a Filipino staff at the Tanjong Pagar outlet who also doubles as the chef, and I must commend his skill with both grilling burgers, and service that is friendly and upbeat. Excellent! 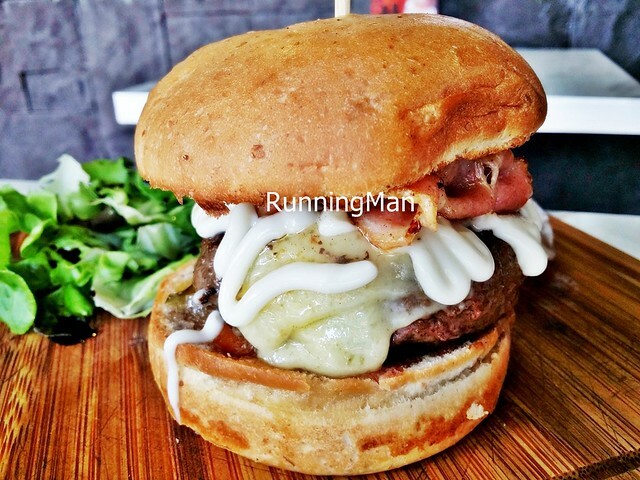 Two Blur Guys specialises in gourmet American style burgers. In particular, they don't mess too much with the star, the meat patties, allowing the natural juicy tastes to shine. 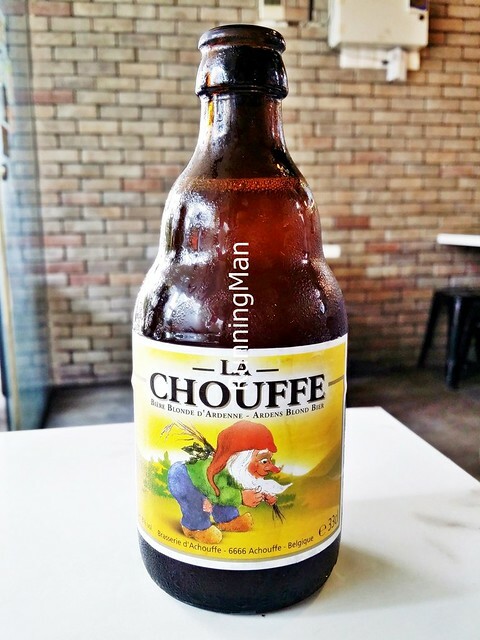 Also worth mentioning is their small selection of craft beers and pastries, which pair well with the burgers. Generally, I find portions at Two Blur Guys to be large for one person, and prices are upper mid-range for a casual cafe, budget about SGD $30 per person. 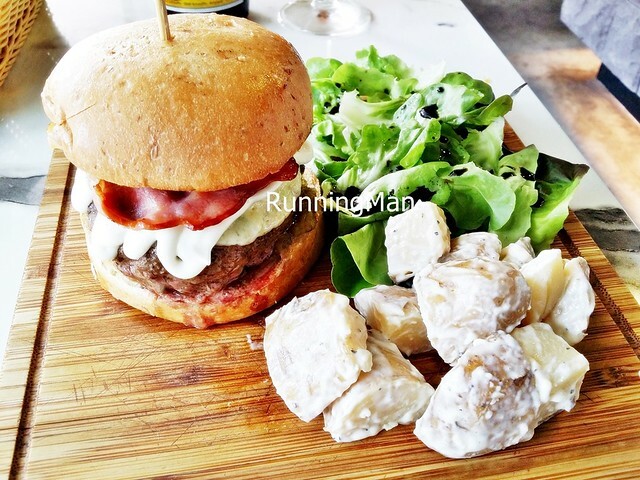 All burgers are served in a set with potato salad and fresh garden salad. 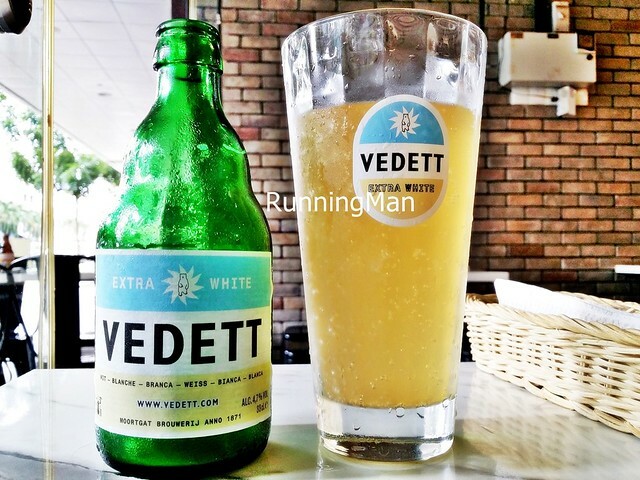 Beer Vedett Extra White (SGD $13.90) has a surprisingly refreshing and light texture, with a crisp orange and lemon zest taste, hazy light yellow colour, aroma of wheat and spice, midly bitter and dry finish. 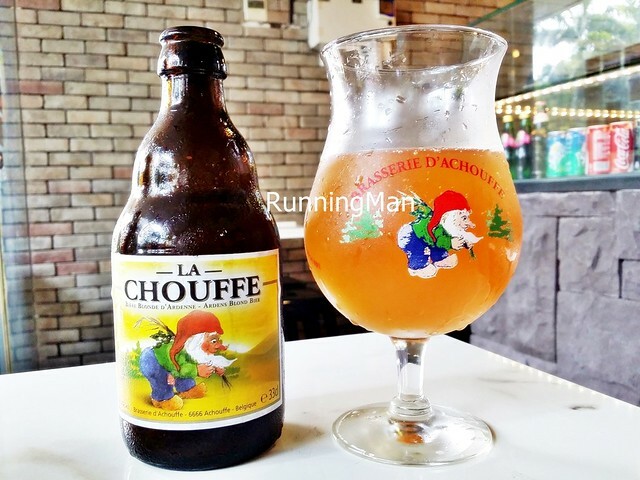 Beer La Chouffe (SGD $13.90) has a bright orange colour, aroma of malt and strawberry, light hoppy and dry taste with hint of biscuit and malt, balanced bitterness and sweetness, medium body yet easy to drink, very refreshing. 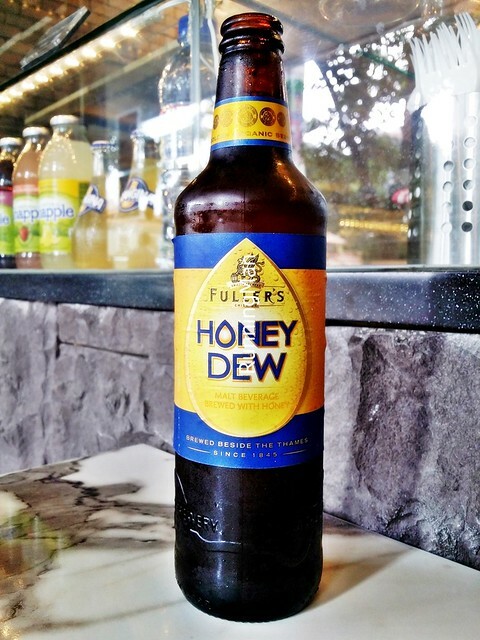 Beer Fuller's Organic Honey Dew (SGD $15.90) is a refreshing, pale light golden beer that has a gentle sweetness, a mild bitterness, and a pleasant aroma of honey. 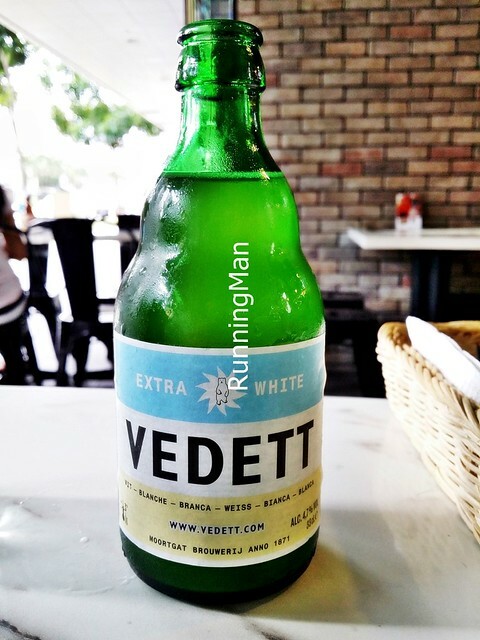 With its zesty edge and being 100% organic, this is a great choice for hot days! 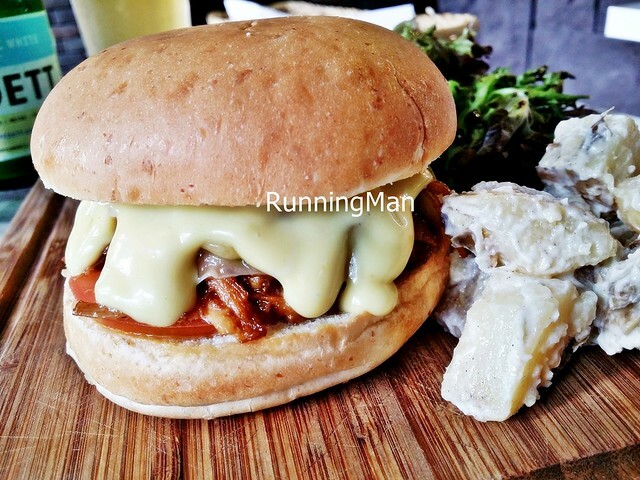 The Pulled Pork Burger (SGD $12.85) features strips of tender pulled pork, extremely soft, so tender, and very juicy! 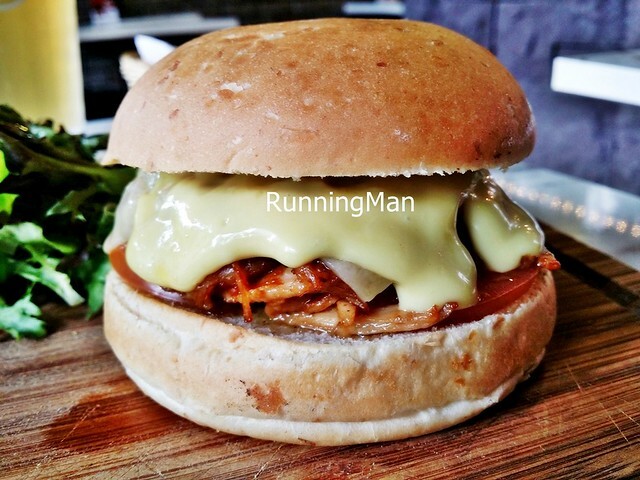 Paried with the wholemeal burger buns, tomato slice, gruyere cheese, and a tangy sweet honey mustard sauce, each mouthful is a juicy, delightful burst of flavour. 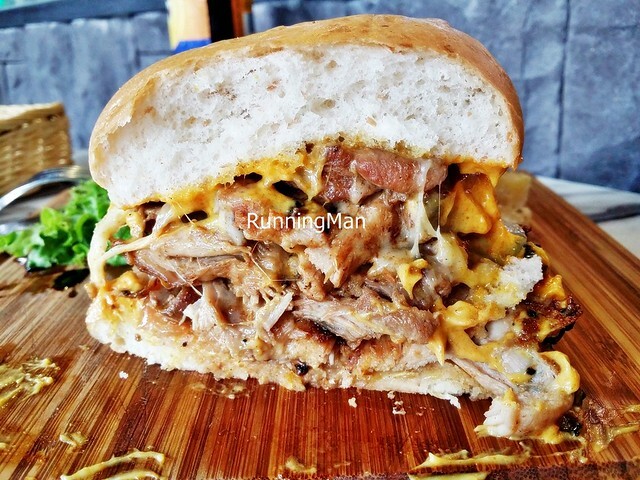 I've had people tell me they dream about this burger, and I daresay this is easily the best American style Pulled Pork Burger I've had in Singapore! Highly recommended! 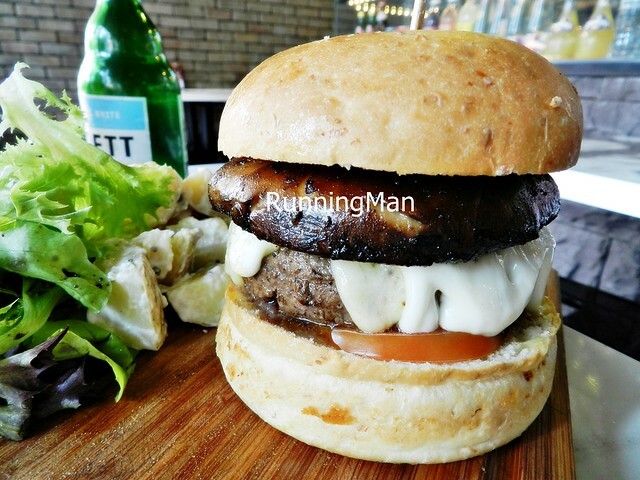 The stalwart and hearty Prime Beef With Streaky Bacon Burger (SGD $17.95) features a thick, meaty, juicy, beef patty that is grilled to perfection. Cut or bite into it and watch the savoury juices trickle clear! 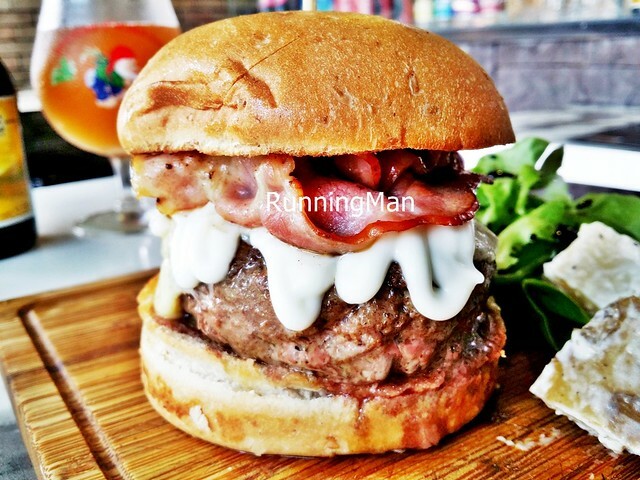 This mountain of a burger is served with wholemeal burger buns, tomato slice, gruyere cheese, and savoury and smoky rashers of bacon, garnished with tangy gherkins. And though it's not stated on the menu, the sauce used is a home made truffle infused mayonnaise, which lends a fragrant, earthy taste to the overall dish. Messy, but highly recommended! 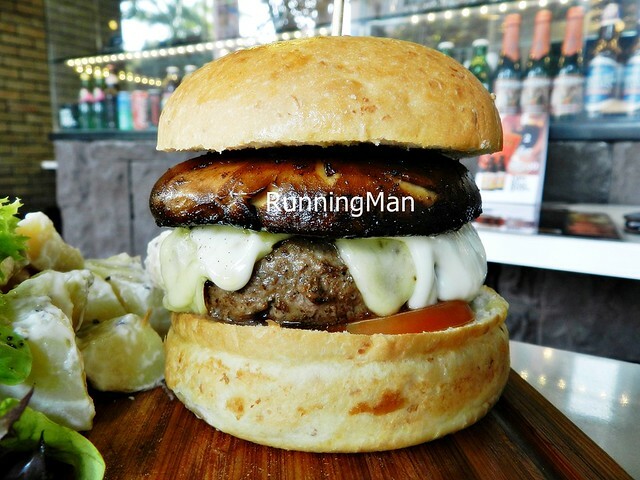 The Prime Beef With Portobello Burger (SGD $17.95) features the same high quality beef patty that is also grilled perfectly, alongside wholemeal burger buns, tomato slice, gruyere cheese, gherkins, truffle mayonnaise, and a thick, meaty portobello mushroom. 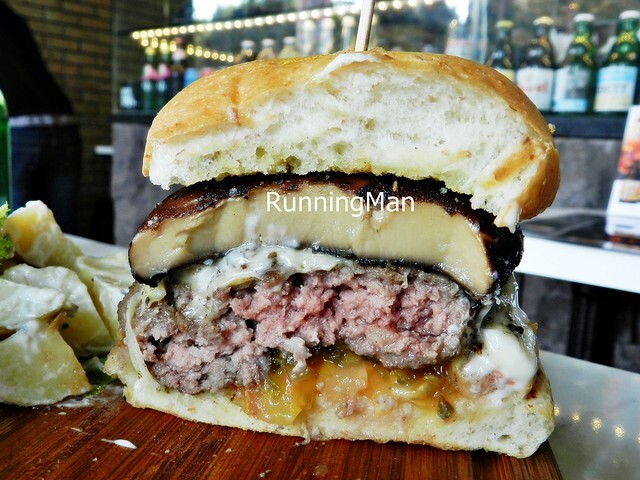 While the mushroom was meaty and moist, pairing well with the earthy truffle mayonnaise, it wasn't as juicy as it could have been, and in comparision with the other burgers offered here, this was only decent at best. Good effort, but get something else instead. 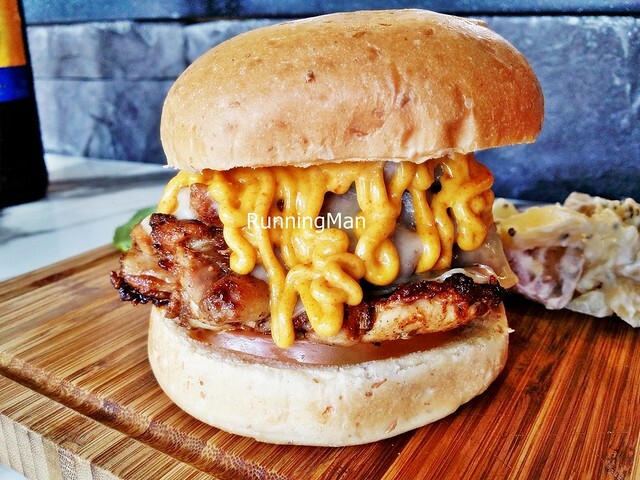 The Grilled Chicken Burger (SGD $12.50) features nicely grilled, savoury pieces of chicken meat, stacked in a pile to form the burger. 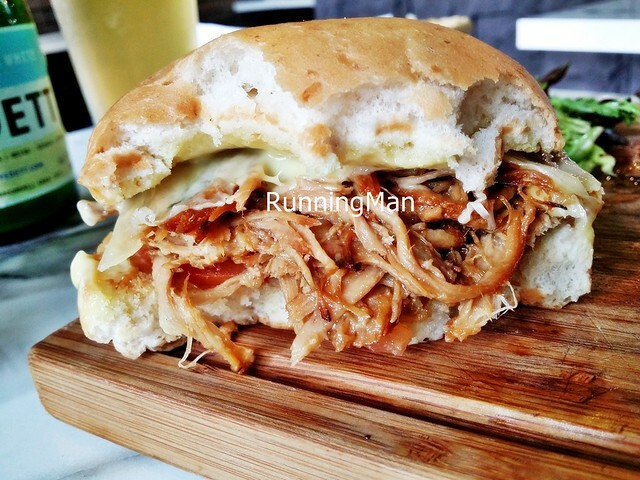 The chicken meat is marinated in a mixture of Asian spices, and served alongside wholemeal burger buns, tomato slice, gruyere cheese, and a home made curry mayonnaise. While the meat is moist and tender, pulling apart easily, the overall dish is rather salty, as both the chicken meat and curry mayonnaise are salted liberally. Sadly, the saltiness makes this great burger simply average. 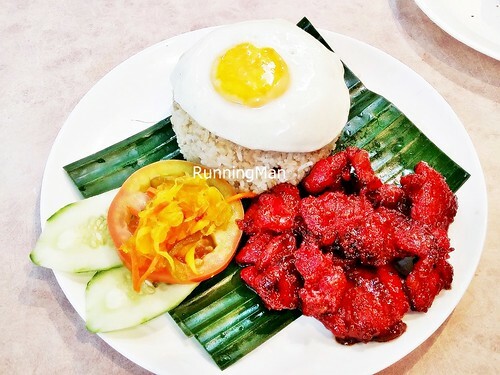 Established in 1994, Kabayan Filipino Restaurant is among the stalwarts of Filipino cuisine in Singapore, having held its own since the beginning. 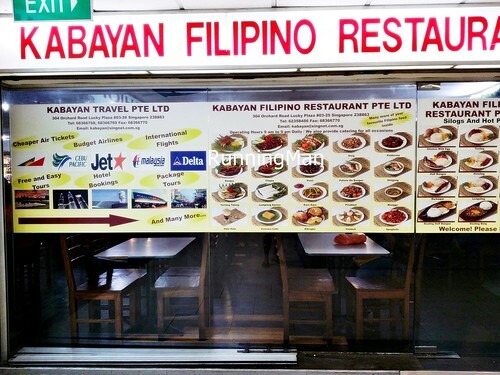 Operating as part of the Kabayan group, which includes Kabayan Travel and Kabayan Remittance, Kabayan Filipino Restaurant is among the best places for Filipino food in Singapore, and the go to place for those yearning for authentic, tasty recipes from home in the Philippines. 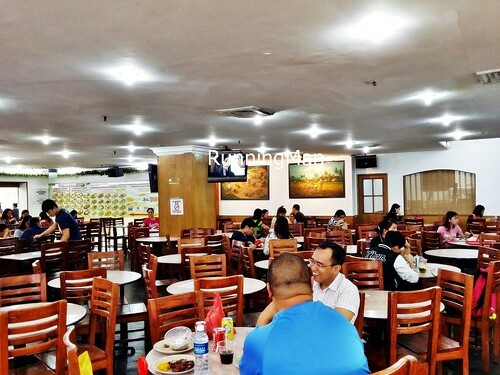 Ambience at Kabayan Filipino Restaurant is similar to a casual cafeteria / food court, but cleaner and more well ventilated. The interior is spacious, but tables are packed quite closely together to maximise seating. I like that furniture is comfortable and sturdy, and the smell of food doesn't linger in the air. The main drawback for me is the dim, low lighting, which makes the place look darker than it should. Service at Kabayan Filipino Restaurant is self-service, cafeteria style. Diners queue up, order from a menu or the large display case, make payment, collect the order, then collect utensils. Still, the staff at Kabayan Filipino Restaurant are very friendly, and most can understand simple English, so ordering isn't a problem. I like that staff are efficient and quick at clearing tables. 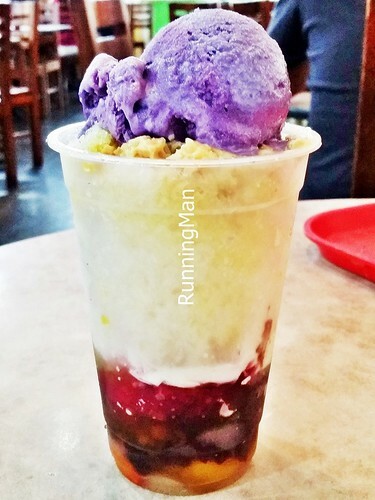 Kabayan Filipino Restaurant also boasts a small in-house bakery which produces authentic Filipino desserts from various regions in the Philippines. Prices at Kabayan Filipino Restaurant are very affordable, considering its location in Orchard Road, Lucky Plaza mall. 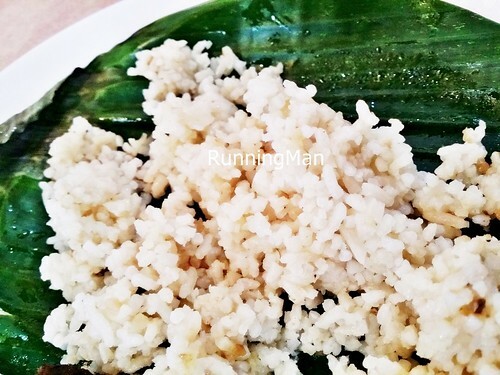 A typical budget meal of rice with 2 dishes costs SGD $4.50 + per person, while a short-order meal from the menu costs about SGD $6.50 + per person. Desserts average about SGD $4 each. Portions sizes for meals are sufficient for 1 person, though desserts portions are large enough to be shared by 2 people. 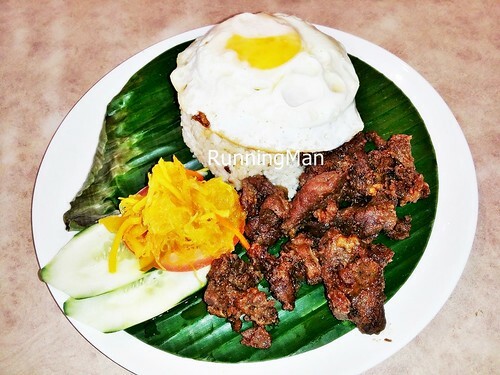 Food at Kabayan Filipino Restaurant is prepared according to authentic Filipino recipes, by chefs who have worked in various restaurants in the Philippines. The result is rustic, home cooked style Filipino comfort food that is tasty and delicious, with each mouthful packing delightful flavour. The variety of food options at Kabayan Filipino Restaurant is extensive, drawing inspiration from various street food, and regional food around the Philippines. The thing about cuisine from the Philippines, is the unashamedly intense taste (sweet, sour, salty) and texture (oily, crispy, tender) of each dish. Known for their bold tasting dishes, Filipino food is neither subtle or balanced, thus, may not appeal to everyone. The best way to consume Filipino food is by pairing dishes, such as sweet and salty, or by pairing with plain white rice. The place doesn't look like much, but fits with the theme of rustic home cooking, casual and comfortable. The majority of diners here are from the Philippines, which lend credibility to their dishes. They also provide catering for events. Tapsilog (SGD $6.50) is the Philippines portmanteau of Tapa, Sinangag, and Itlog (Fried Sunny Side Up Egg), served with a side of Atchara (Pickled Payapa Salad), and fresh cucumbers and tomato slices. A one-dish meal usually consumed for breakfast in the Philippines, here it's served only for lunch and dinner, with the portion size being rather large. The salad, with its sour tangy taste, makes a nice foil to cut through the savoury taste of the meat. 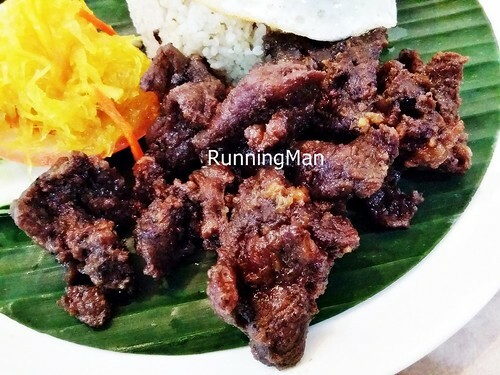 Tapa refers to Filipino dried meat cured with salt. 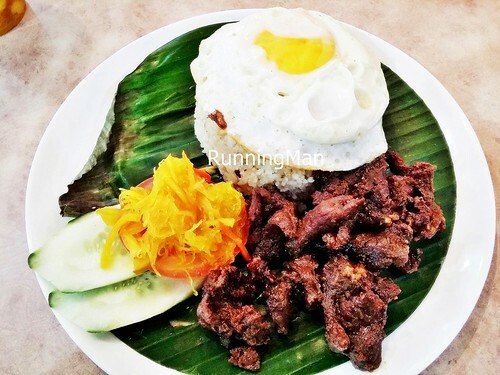 Beef Tapa (SGD $3) is the most common version of Tapa, typically served fried or grilled. The Beef Tapa here is tasty and flavourful, I daresay among the most intense meaty taste I've ever had, even while I was in Manila! Not overly dry, salty, or stringy, the beef tears apart easily. Very good! The deceptively plain-looking but fragrant Sinangag (SGD $3), or Garlic Fried Rice, has a strong but pleasant aroma that hits you when served. The rice grains are nicely fried with an even coating of the garlic flavour, albeit slightly oily. Rather sinful, but so addictive you can't stop eating it! 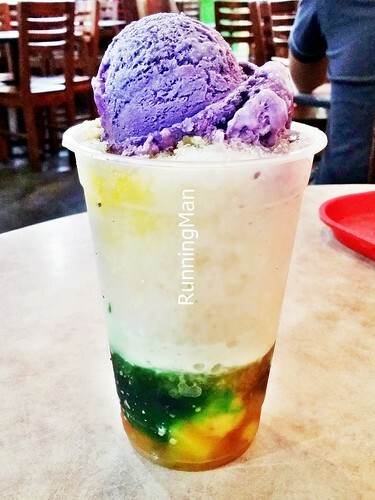 Considered the national dessert of the Philippines, Halo-Halo (SGD $3.90), or 'Mix-Mix', consists of a mixture of shaved ice and coloured sugar syrup, topped with a variety of ingredients. Here, the garnishes include kidney beans, plantains, sweet potato, attap seeds, gulaman seaweed jelly, purple yam / taro ice cream, and coconut milk. The name of this iconic and much loved dessert is pronounced 'Hello-Hello', and it's similar in style to the Chendol dessert of Singapore and Malaysia. 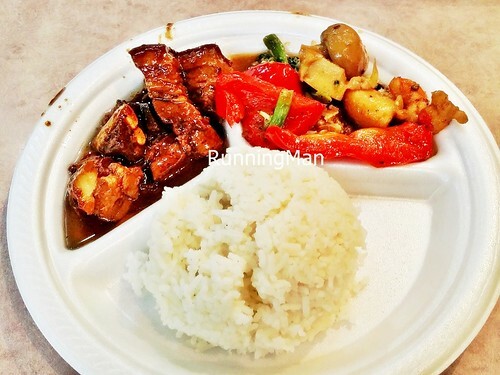 The Budget Plate, also called the Turo Turo Plate (SGD $4.50), consists of plain white rice, with 2 dishes of your choice. 'Turo Turo', which means 'Point Point', is similar in concept to an economical rice stall, where you point to indicate which dish you want. Choose from about 20 or so traditional, classic Filipino dishes, with premium items costing slightly more. For an affordably low price of SGD $4.50 per plate, the portion size is sufficient for one, and it's the default option for many diners here! Adobo Pork (SGD $2) is made by slow braising / stewing pork belly in a sauce of pepper, garlic, vinegar, soy sauce and bay leaves. The result is tender, soft, and fragrant meat, that is both salty and savoury. This national dish of the Philippines is best eaten with plain white rice. The version here is very oily though, I typically allow the oil to drip off first before eating it. 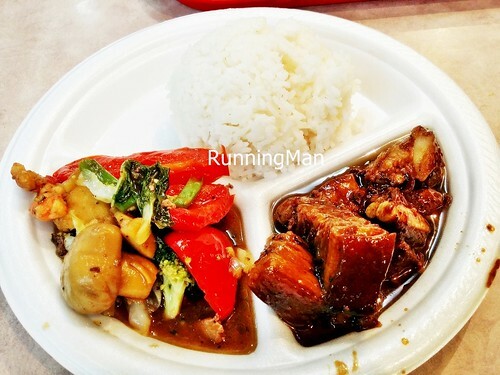 A popular and common Filipino Chinese fusion dish, Chop Suey Guisado (SGD $2) consists of a medley of vegetables, stir fried together with either meat or seafood. 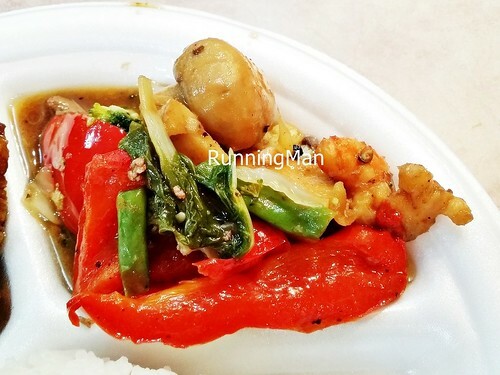 The version here includes spinach, button mushroom, onions, bell peppers / capsicum, cauliflower, broccoli, and cabbage, stir fried in oyster sauce, with prawns, fish cake, and a small amount of pork liver. The vegetables are fresh, tasty, and clean, plus the overall dish isn't too oily. But it's slightly let down by the use of frozen prawns. 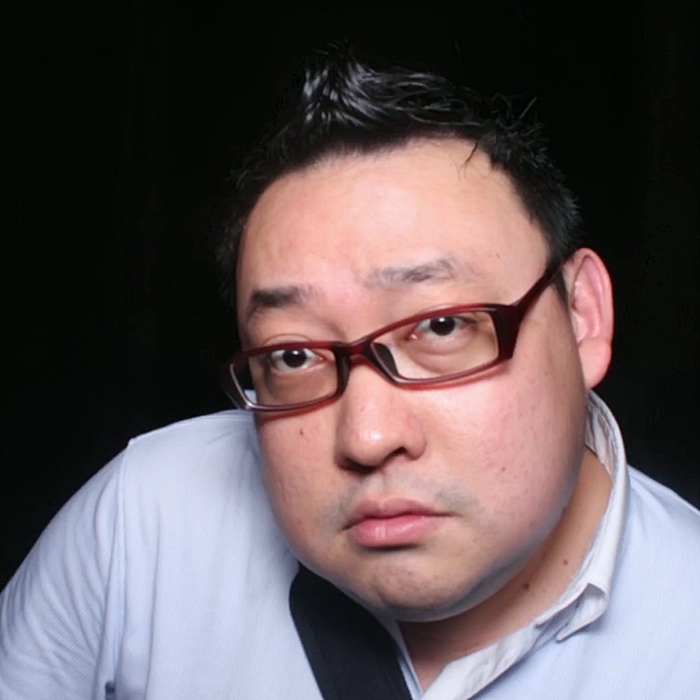 The use of pork liver though, surprised me, as it lent an earthy taste to the vegetables. 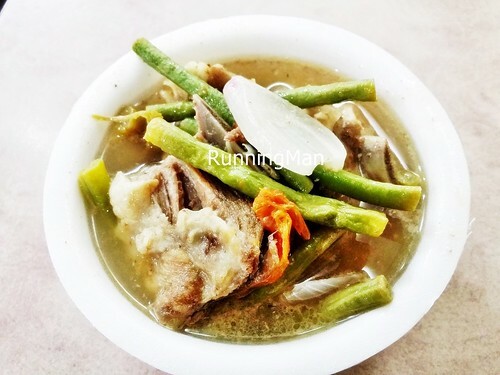 Sinigang Pork (SGD $2) is a popular Filipino stew that derives its signature sour flavour from tamarind. 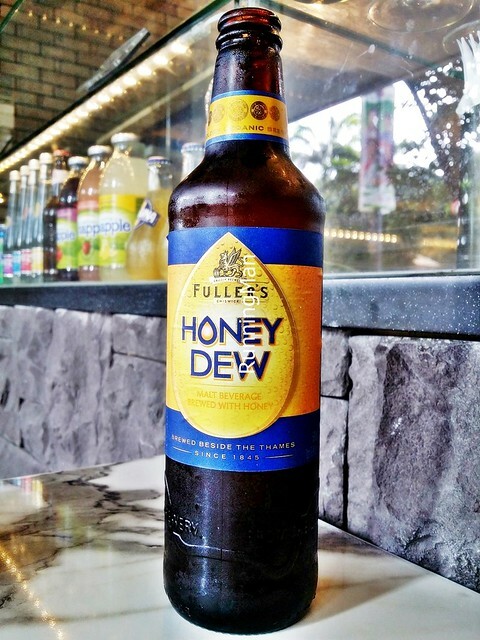 Whilst commonly eaten by locals of the Philippines, it's an acquired taste for Singaporeans, being more sour than anything in Singaporean cuisine. I quite like it though! 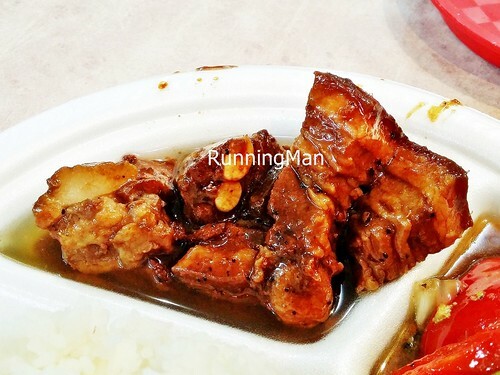 The pork ribs within the soup are soft and tender, with the meat coming off the bone easily. The vegetables, which include tomato, onions, eggplant, string beans, and white daikon radish, are fresh, and super soft. Best eaten with plain white rice! The people of the Philippines love their pork, with a large majority of their food revolving around it! A hot item with the Filipinos here is the Lechon Kawali Roast Pork Belly (SGD $4), it features a crisp crackling / skin, that shatters when bit. However, I find the meat to be very dry. 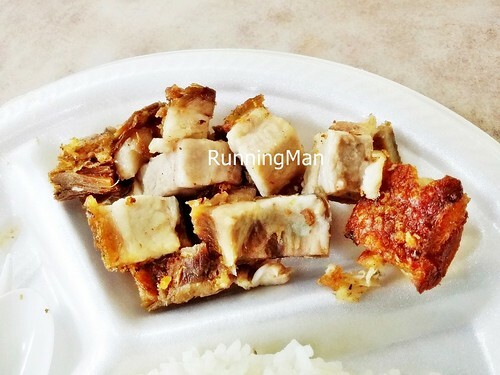 In a Singaporean context, this dish is average at best, you can easily get better Chinese roast pork from a Cantonese roast meat stall. I've tasted better renditions in Manila too. Probably the weakest dish available here, skip this! 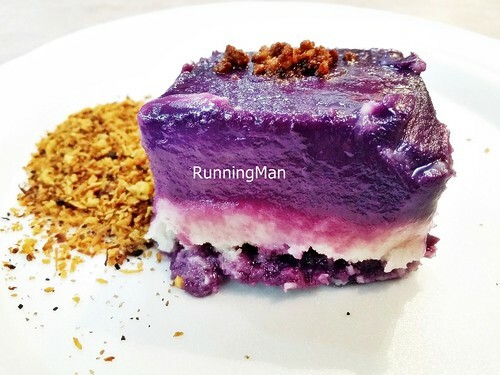 Kalamay Malagkit Ube (SGD $2) is a popular dessert in the Philippines. 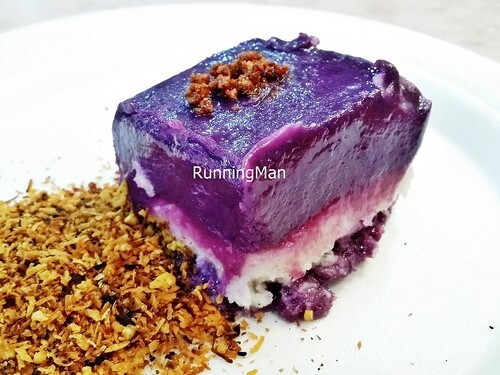 'Kalamay Malagkit' refers to a glutinous rice pudding cooked in a banana leaf with sugar and coconut milk, while 'Ube' refers to a purple yam / taro. The yam / taro is grated, and combined with the sweet sticky rice to form a soft, but firm textured cake / pudding. Vanilla is sometimes added to the sticky rice for flavour, and the final dessert is usually garnished with fried coconut flakes. 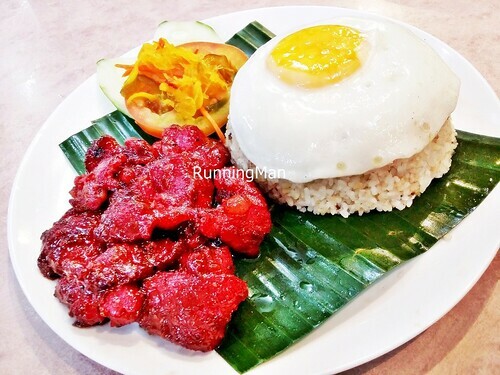 Another one-dish meal usually consumed for breakfast in the Philippines, Tosilog (SGD $6.50) is the Philippines portmanteau of Tocino, Sinangag, and Itlog (Fried Sunny Side Up Egg), served with a side of Atchara (Pickled Payapa Salad), and fresh cucumbers and tomato slices. This dish is a sinful, guilty delight, being rather oily, but also very flavourful. Tocino refers to Filipino style bacon, made by curing pork loin meat or pork belly in a mixture of water, salt, sugar, annatto seeds, and aniseed. 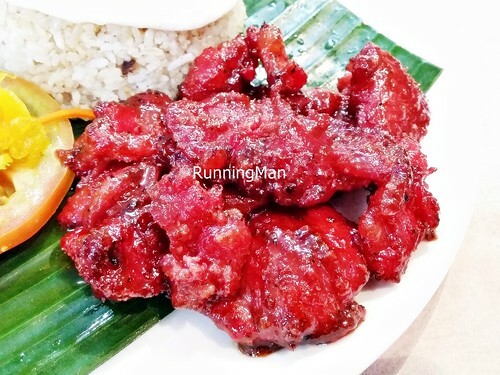 This results in Tocino Pork (SGD $3) having a slightly sweet and tart flavour, alongside its savoury taste and firm texture. Less salty than regular bacon, it's almost similar to Chinese style Bak Kwa, only with a sweet taste at the front, and a thicker, meaty texture. 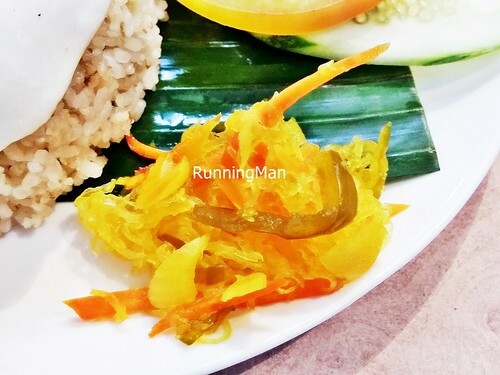 Atchara Pickled Papaya Salad (SGD $0.50) is usually served as an appetizer or as a side dish to a meal. Made with unripe green papaya, bell peppers / capsicum, onions, carrots and garlic, the mixture of vegetables is then pickled in a solution of vinegar, sugar, and salt. Although every region in the Philippines has its own version, the flavour of this salad is generally tart, sour, and refreshing. Best served when accompanying fried or oily foods, the salad lends a burst of crunchy freshness, and relives the heaviness of the oil. 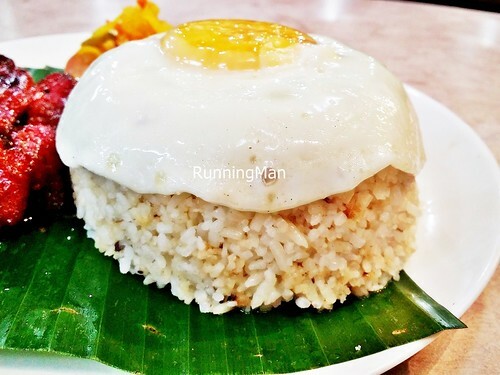 Silog is the Philippines portmanteau of Sinangag and Itlog (Fried Sunny Side Up Egg), and can be added on to almost any main dish (meat or seafood), to create a one-dish meal. The good people of JustTheFlight have compiled a 2014 list / infographic of the top 40 Travel And Tourist Scams To Be Wary Of. The 40 Tourist Scams to Avoid breaks down the travel scams by type, and the destinations where the travel scam occur most frequently. Good to watch out for these and plan ahead! But Is The Book Better? 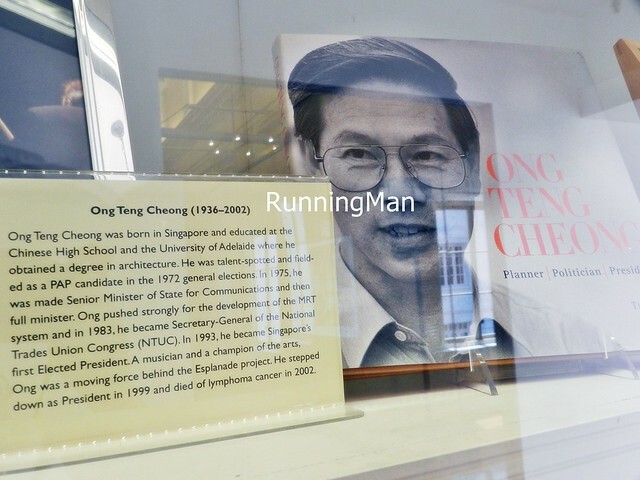 The former seat of Singapore government in the 1960s to 1990s, the Arts House At The Old Parliament is a literary and visual arts centre that showcases both Singaporean and international writers and artists. 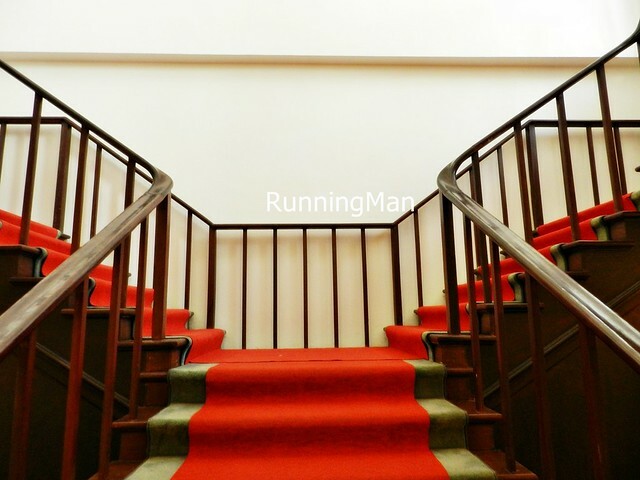 Arts House At The Old Parliament was established in 2004, and explores a variety of art disciplines such as dance, film, music, written, and visual art, all via a rotating schedule of programmes. 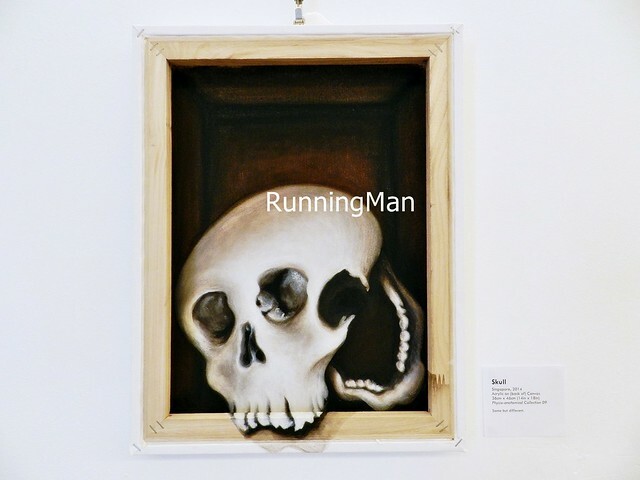 There's always something new at the Arts House At The Old Parliament every month! 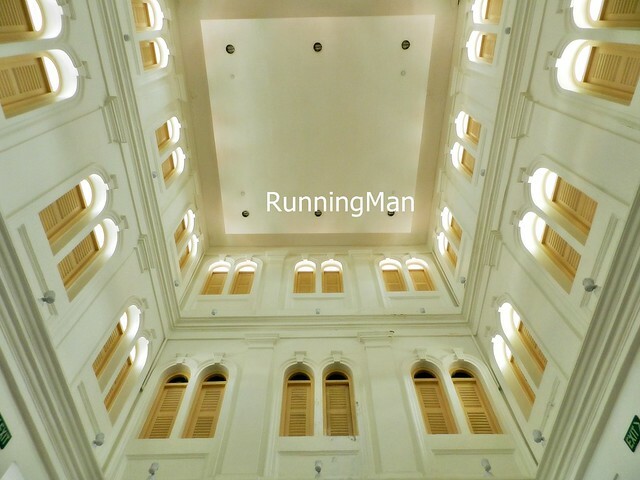 Like most other government buildings built in the 1850s, the Arts House At The Old Parliament is designed in the Victorian Revivalism style of architecture. 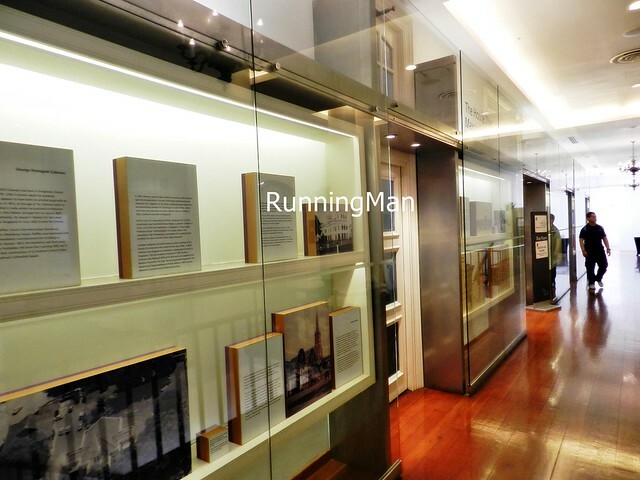 The majority of corridors here have been converted into various galleries / exhibition halls, such as the Open Gallery, Print Gallery, Film Gallery, and Milestone Exhibition. 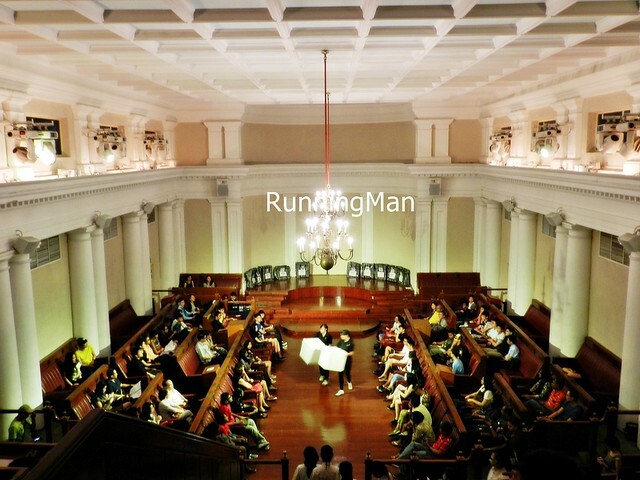 These galleries showcase various artworks, or the history of the Arts House At The Old Parliament, or Singaporeans that helped in the development of the nation. The Arts House At The Old Parliament has several regular, ongoing series. They include; But Is The Book Better? 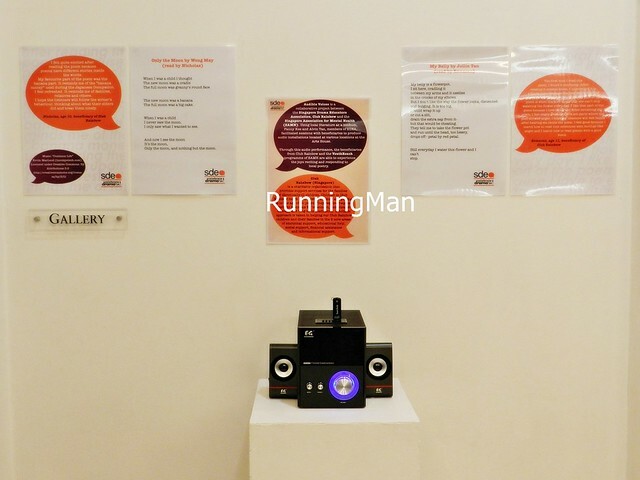 which debates the merit of print-to-screen adaptations; Cita, which examines Malay literature and art in Singapore; and The Alphabet Series, comprising 26 music recitals over 5 years, each themed around a letter of the alphabet. During my visit, the ongoing series was the Modern Day Slavery Film Forum, a series of films that give insight into the current state of human trafficking in the modern day slave trade worldwide. One of these films, The Day My God Died, is a sobering, thought provoking documentary into the slave trade in India and Nepal, with several scenes filmed using spy camera technology. If you're planning a visit to the Arts House At The Old Parliament, do allocate between 1 - 3 hours for viewing if you're attending one or more programmes. General viewing will take less than 1 hour, and admission is free. Ticket prices to the art programmes varies. On weekends, there tend to be more scheduled programmes at the Arts House At The Old Parliament, making it the best time to visit.